MILWAUKEE (AP) Forget ending his epic winless streak. For a while, Ryan Dempster was thinking about throwing a perfect game. Dempster retired the first 15 batters he faced and went on to earn his first win since last August, throwing seven innings of three-hit ball as the Chicago Cubs beat the Milwaukee Brewers 10-0 on Tuesday night. Coming into Tuesday's game, Dempster (1-3) had gone 18 straight starts without a victory - a streak dating to Aug. 16 of last season. Dempster broke his winless streak in dominant fashion, not allowing a baserunner until Cody Ransom singled to lead off the sixth. Alfonso Soriano hit a three-run home run, Jeff Baker added a two-run shot and Bryan LaHair hit a solo homer for the Cubs, who snapped an 11-game road losing streak. Chicago's road slide matched a franchise record set in 1954. 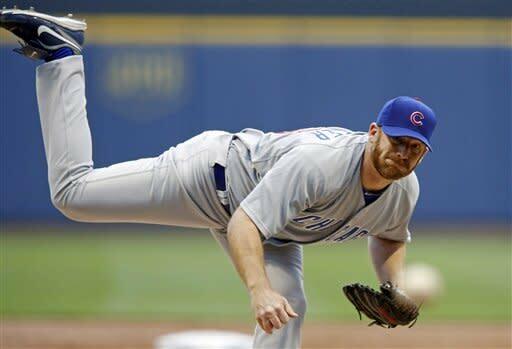 It wasn't a shock for Dempster to break the streak against the Brewers. Coming into Tuesday's game, he had a 15-6 career record against Milwaukee with a 2.75 ERA. And he had plenty of support from a significant number of Cubs fans who made the drive up I-94. Dempster wasn't pitching terribly during his winless streak, posting a 3.95 ERA over those 18 starts. But the Cubs had scored three runs or fewer in 16 of those games. Scoring runs for Dempster wasn't a problem for the Cubs on Tuesday, as they got five runs in six innings off of Brewers starter Yovani Gallardo (4-5). Ryan Braun was back in the lineup for the Brewers after missing two straight starts because of a nagging right Achilles' injury, plus a strained right hip that took him out of Friday's game. Braun appeared as a pinch-hitter Sunday, and the team was off Monday. In the first, Gallardo allowed a one-out single to Starlin Castro, then walked David DeJesus. 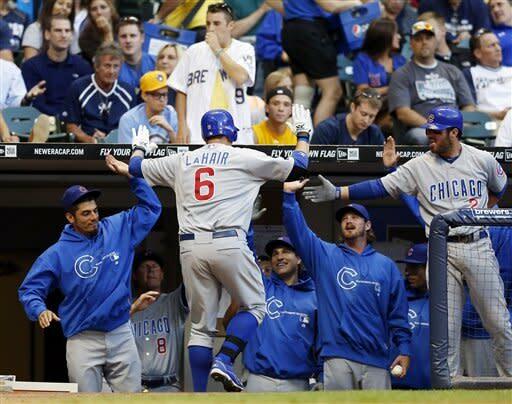 Soriano then hit a pitch just over the fence in right field, his ninth of the season, to give the Cubs a 3-0 lead. Castro had three hits and a flawless night in the field after earning Sveum's ire for not knowing how many outs there were on a play in Monday's loss at San Francisco. ''I listened to him, because it's my fault,'' Castro said. As Dempster cruised through the first four innings, the Cubs took a 4-0 lead in the fourth when LaHair hit his 11th homer of the season. Gallardo gave up another run in the fifth. With one out, Tony Campana reached first on an infield hit after Gallardo and first baseman Corey Hart got crossed up on a ground ball. Campana then took third on a single by Castro, and went home on a sacrifice bunt by DeJesus. 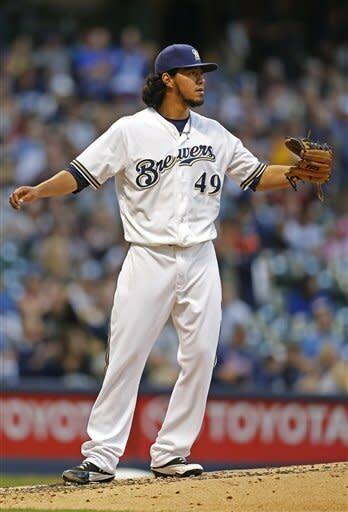 Gallardo struck out Soriano to end the inning. Meanwhile, Dempster continued to mow down Brewers batters, throwing only 62 pitches through five innings. He finally gave up a single to Ransom to start the sixth, then a two-out single to Carlos Gomez, but he got Norichika Aoki to fly out to end the inning without allowing a run. Things really fell apart for Milwaukee in the eighth. After an RBI single by Steve Clevenger left runners on first and second with two outs, Darwin Barney hit a bloop single that scored Soriano - and the Brewers couldn't tag Clevenger out despite getting him caught in a rundown. Brewers reliever Tim Dillard intentionally walked Ian Stewart to load the bases, then walked pinch-hitter Adrian Cardenas to make the score 8-0. Campana grounded out to end the inning. Appearing as a pinch hitter in the ninth, Baker made it 10-0 with a two-run shot, his first homer of the year. Notes: Gallardo had 10 strikeouts, the 16th double-digit strikeout game of his career and first this season. ... Brewers third baseman and longtime Cubs slugger Aramis Ramirez was out of the starting lineup with a left quadriceps strain.... LHP Paul Maholm (4-4, 4.82) faces RHP Zack Greinke (6-2, 3.46) in the second game of the series Wednesday night.